Is Utterby Halt railway station haunted? Utterby Halt railway station was a typical small village railway station. Built in 1905 the station consisted of 2 platforms, a shelter and a small hut equipped with a heating stove. The station ran up until 1961 and was later demolished, removing both platforms and the the 2 small buildings. All which remains today is the keepers cottage, which is now a private residence and a signal post, as well as a few pieces of rubble. The only reason this area with nothing much left in is so well known is because of its hauntings. The line were the tracks ran is now just a dirt lane and there isn't really anything to see as the keepers cottage is private. The area has a few ghost stories connected to it. The most well known of which is the story of a man named John Edward Lancaster who was a worker on the railway. Well, to be fair its not really much of a story since all that happened is he was crossing the track in dense fog and got hit by a freight train in January of 1953. His apparition has been reportedly seen since the 1960's by many people, said to be walking along the side of the line or gazing down the tracks. There are a great many stories of what this spirit it thought to do to people, or what people have seen him doing but the story has turned into something of a local campfire story and most likely been heavily altereted or fabricated. The death of the worker on the line was officially documented, but whether his spirit lingers there still doesnt seem to be clear. As for other ghosts at this site there are a few other tales, but one interesting one which has been reported more than once is that of a genuine ghost train. There were no train wrecks along the line near the area, so why there is a ghost train doesnt seem to be clear, but people have even claimed to have got stuck on the lane and seen a ghost train coming towards them, only to pass straight through their cars. 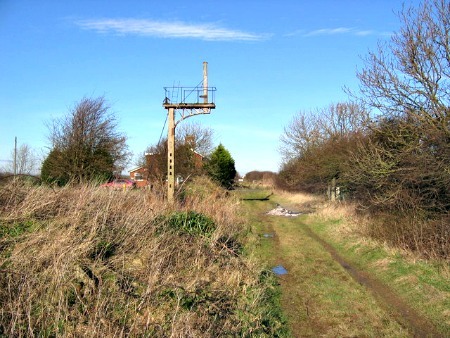 People in the local village have also said they sometimes hear the steam whistle coming from were the tracks were, which is strange because the tracks were taken up in 1956.